Music is magic, but if you have a kid in the band at school you also know that it’s expensive! And that’s a fact. Sure music fills our hearts and our ears with joy, but it also empties the wallets of many a parent for new musical instruments—which don’t come cheap. So what do you do as a thoughtful parent if your little Jimmy or Susie wants to play the tuba, but you don’t have the cash? You turn to school band fundraisers, that’s what! School band fundraisers help kids add a little music to the lives of the school. The band, after all, makes many special moments unforgettable. Take seasonal pageants, sports games or pep rallies for instance. However, school bands, more than any other school team, require the most funds. Not only do school band members need to pay for transportation to band trips, they also need to pay for uniforms, maintenance of musical instruments, new musical instruments, music lessons, and sheet music and band activities. Unfortunately most school band programs are not well funded enough to handle all of these requirements. So where does that leave the music in your school? If your child is in a school band, they probably hold fundraisers on a regular basis to incur all of the demanding costs. If you are a concerned parent or a responsible teacher that is helping to come of with fundraising initiatives for your band, we have come up with a unique and fun collection of fundraising ideas for your band. These include the usual suspects—scratch cards, candy and chocolates sales, candles and etc. However we’ve also included some additional unique and fun fundraisers that will have the band making beautiful music all year long. The most important thing to remember with band fundraising projects is to come up with fundraisers that maximize profit and minimize effort. The more band members can do without having to purchase a lot of materials to hold a fundraiser, the more profit they should expect to come in for the most important thing—their music! If you must sell something to music fans, why not make it something music or entertainment themed? Look online for mini saxophone magnets, band t-shirts, hats and sweatshirts with the band logo, signed posters or concert brochures, or even CDS or DVDs of live concert performances. 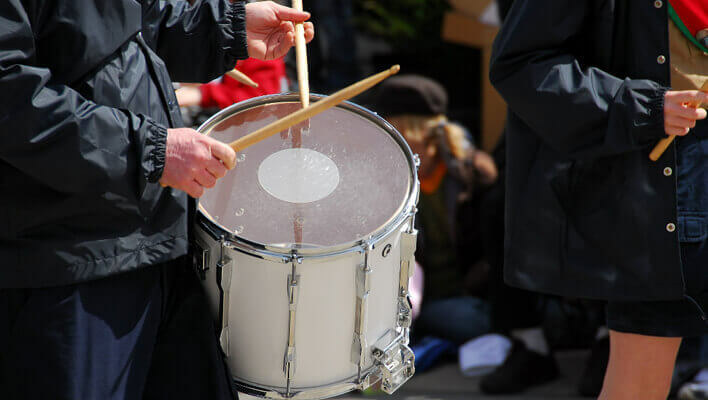 Door-to-door sales are very popular school band fundraising ideas, simply because they bring in a lot of donor dollars. Students can sell a variety of items—chocolate bars, candy, candles, flowers, magazine subscriptions, food coupons, spa services and etc. However, if you are sending students out to sell door-to-door, remember student safety comes before fundraising dollars. Students should never go alone around the neighborhood at night. Instead, send them in pairs. Maybe one could play an instrument while the other makes a sales pitch. This makes fundraising entertaining and safe. Similar to the holiday tree gift giving fundraiser or the adopt a tree charity event, an sponsor a band fundraiser asks donors to give money in order to sponsor a band member’s uniform, transportation to concerts and band competitions, sheet music, instrument maintenance and etc. If the price of sponsoring a student for one donor is too much, encourage an office or a family to split the cost. Now this event is fun, entertaining and music to everyone’s ears! Set up a musical telegram service for one day. Sell tickets in advance and divvy students up into pairs or send them with a friend or parent. This would work the best if it was arranged on a weekend when the majority of folks are at home and relaxing for the weekend. The telegram service would take orders and send each student out with their instrument to the address of the recipient. The band member would arrive at their residence or location and play the donor’s song of choice for the recipient. So instead of sending flowers, they are sending music. Most people who support the band love music. So why not make the selling easy by making the prize something that everyone enjoys—tickets or discounts off of a live event. This can be the city orchestra, local jazz band, coupons for a night spot that hosts live acts or tickets to the school band’s events.